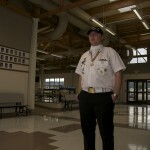 Robert Eckmann first came to St. Ignatius Montana in 2007, during the time between his first and second tour with the U.S Marine Corps in Iraq. He came to St. Ignatius following his friend Jessie Courville, whom he had med while serving in Iraq. There he met his future girlfriend Kim Wilkinson and joined the Mission Valley Honor Guard headed by Courville’s father, J.C. Eckmann fell in love with the mountains and couldn’t wait to get back. After his break in Montana Eckmann returned to Hawaii where he was stationed. He soon there after started a relationship with Wilkinson eventually having her come to Hawaii to spend time with him before he re-deployed. Robert deployed in August of 2008 and shortly thereafter found out Wilkinson was pregnant. Following the end of his second Iraqi tour Eckmann moved to nearby Missoula to study at the University of Montana and started studying history and creative writing, but his thoughts were in St. Ignatius. So in the spring of 2010 Eckmann moved his mom and himself to St. Ignatius, where he could be a father and a friend. In St. Ignatius Eckmann’s life is multifaceted being a veteran serving in the Honor Guard in one moment and a father the next to his 3-year-old son Wyatt. In another moment a student and later that night a devoted war aficionado, a boyfriend by day and a Dungeons and Dragons player by night. There is no simple way to describe Robert Eckmann. 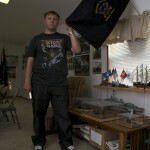 Robert Eckmann displays the Mission Valley Honor Guard Flag before their meeting on September 13, 2011. Eckmann joined the honor guard in 2007 and moved to St. Ignatius in March of 2010. 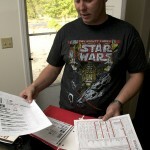 Robert Eckmann displays two model tanks that are part of his extensive Axis and Allies miniatures collection. This collection includes vehicles of all sorts, warships, infantrymen, and artillery. Every piece is backed by a card, which displays its abilities and historical background. Eckmann got into Axis and Allies while serving in the Marines. Robert Eckmann and his girlfriend Kim Wilkinson stand outside his home in St. Ignatius Mont. They have a 3-year-old son named Wyatt. 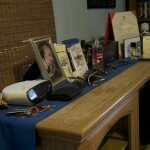 Eckmann’s mantle displays the many facets of his life. The father, Marine, student and avid movie fan all come together in one place. Robert Eckmann plays with his dog Sadie outside his home in St. Ignatius. Despite being a stray he claims that Sadie may be one of the best-behaved dogs he has every owned. On September 30th, Sadie gave birth to a healthy litter of 11 puppies; however, only 10 survived. 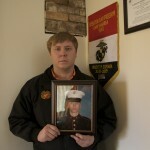 Robert Eckmann poses with his Marine portrait at his home in St. Ignatius Montana. Behind him is his Iraq War service flag. 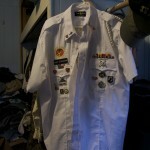 Eckmann’s Honor Guard uniform hangs in preparation for his next event. Eckmann displays a nametag of Milt Eckmann on his uniform as a tribute to his father who was a Korean War Veteran. Robert Eckmann explains the ribbon bar on his Honor Guard uniform. From top left to bottom right they are a follows: Combat Action Ribbon – given when you have been in combat with the enemy; National Defense Ribbon – given you volunteered to serve during a time of war; Iraq Campaign Ribbon – given for serving in a tour in Iraq, the stars indicate a second and third win of the ribbon; Global War on Terror Service Ribbon – given for serving during the global war on terror; Sea Service Deployment Ribbon – given for any service overseas. 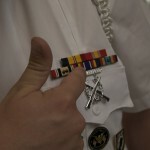 The badge or two crossed rifles below the ribbon bar indicates that he is an expert rifleman. This is given when you achieve the highest score possible on the rifle range. Eckmann prepares to deliver a speech about the events of September 11th at the Mission Valley High School. The speech was given as part of the Native American Heritage Day assembly at the high school on September 19th. The assembly also included Native American dance, drums, and singing. 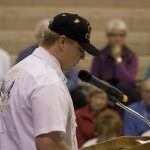 Eckmann delivering a speech on 9/11 during the Native American Heritage day assembly, September 19th, at the Mission Valley High School. 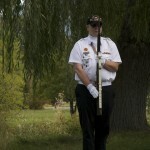 Robert Eckmann stands at attention during the Gold Mothers Day ceremony on September 30th. Although the Honor Guard had their rifles, they were strictly for appearances as event organizers were concerned that the rifles firing would frighten family members. At the University of Montana, Eckmann is a sophomore studying Creative Writing and History. 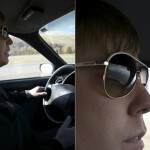 The Mission Mountains reflect off Eckmann’s glasses as he drives back home from the University of Montana. Every day of the week Robert commutes 45 minutes to attend classes as the University of Montana.